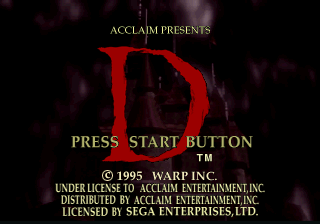 D, called D no Shokutaku (Ｄの食卓) in Japan, is a 1995 horror game by Warp for the Sega Saturn. It received two sequels, Enemy Zero on the Saturn and D-2 on the Sega Dreamcast. The creators wish to thank: Acclaim Japan Ltd., Sega Enterprises, Ltd. Presented by: Acclaim Japan Ltd.